Man Rants About “Police State” On Facebook And Guess Who Shows Up? 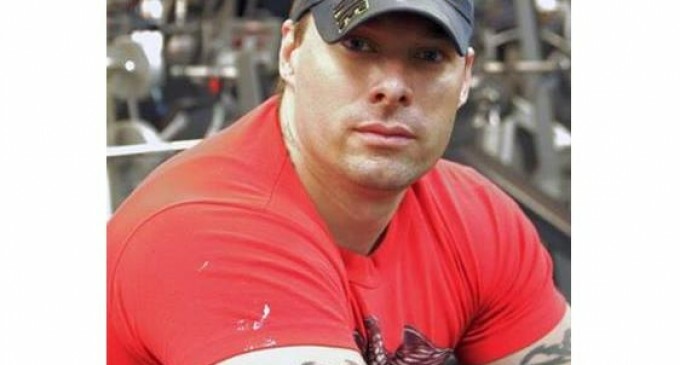 A man who posted a rant on Facebook venting his frustration with the government and encroaching police state was contacted by the FBI within 24 hours of his post. 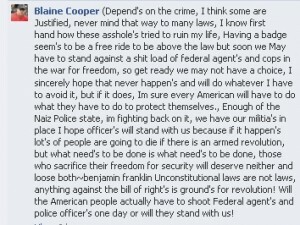 After 34-year-old Blaine Cooper from Humboldt, AZ posted his rant on Facebook FBI agents showed up at his door and brought him in for questioning for 45 minutes. “The FBI made mention they came to question me so they didn’t have to kick in my door,” Cooper said. Cooper admits to being part of a militia, which is why his posts were probably taken more seriously by the Feds. Still, this man was threatened and questioned by the Feds for exercising his free speech. If you read his post, he made no immediate threat to any one particular person. disable Pv – P, use your existing world, and more. I’m not saying this wouldn’t be a big deal no matter where it happened. that it becomes very difficult to understand even for the persons who are fluent in English. that’s when you ask for a Warrant and politely tell them to $#%&[email protected]* off. This country is what it is because of Militias and Minutemen back in the founding years. Since when is a militia of patriots concidered a threat? I can’t help but think back to Obama’s speech about whispers of tyrrany around every corner. The police state is no different than the Gestapo, all paranoid for committing evil on the people.